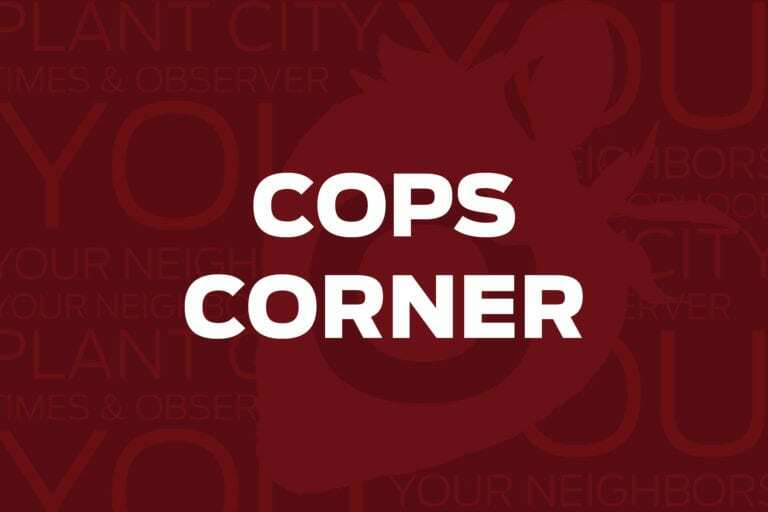 This week on Cops Corner, Plant City Police investigated repair shops, visible drugs and swiped baby formula. 4100 block of Longfellow Dr.
Trespass conveyance: This complainant told police that early on the morning of Jan. 25 an unknown suspect entered his vehicle, rummaged through it and then left without taking anything. 1400 block of S. Alexander St.
Criminal mischief: When the employees of this carwash arrived at work early on the morning of Jan. 25 they found the large plate glass window of the business, which was valued at $1,000, had been shot out from the front of the car wash.
3400 block of James L. Redman Parkway. Recovered stolen vehicle: Officers came out to the location after a GPS indicated a stolen vehicle had been left there from Hillsborough County. The Mustang was recovered, but they found vehicle damage on the car. They turned the vehicle over to the owner who arrived on-scene after being notified of the recovery. 200 block of W. Alexander St.
Retail theft: An employee at this establishment told officers multiple cans of baby formula and other miscellaneous items, which totaled approximately $100, were stolen. Abandoned vehicle: Officers came out to the intersection of Processor St. and Hunter St. and found a boat and trailer within inches of the roadway. The boat was blocking the view of drivers exciting Hunter St. Attempts were made by police to locate and contact the owner of the boat and trailer, but they were unsuccessful. The boat was impounded by Brewingtons and registered as abandoned. Drug arrest: A man was driving through town with a front headlight that didn’t work. Officers stopped him and when they walked up to the window they saw drug paraphernalia in plain view. The driver was arrested for drug possession and paraphernalia. Robbery by sudden snatching: This victim had just purchased $98 worth of scratch off tickets, hoping to be the next big winner. As he walked out the door the large pile of tickets were snatched from his grasp and the suspect fled the scene. 2300 block of James L. Redman Parkway. Stolen/Recovered vehicle: This victim told officers he left his vehicle at a transmission shop to be repaired. As he was waiting to get the call it had been fixed he was notified the vehicle had been impounded in Tampa to a towing company. There was no information about how or why the car was there. 800 block of W. Spencer St. Felon in possession/L&P: Officers came to the area after receiving word a man was pointing a handgun at passing motorists. The man in question was arrested for multiple offenses and transported to Orient Road Jail.